Learn to create an expressive work of art in the style of Intuitive Painting. Students will be introduced to a variety of skills including mark making, unique colour combinations, glazing and more to create a unique piece of art to take home that day. These workshops are geared towards both beginners and intermediates. Join us for an evening of painting in an encouraging and relaxing atmosphere! 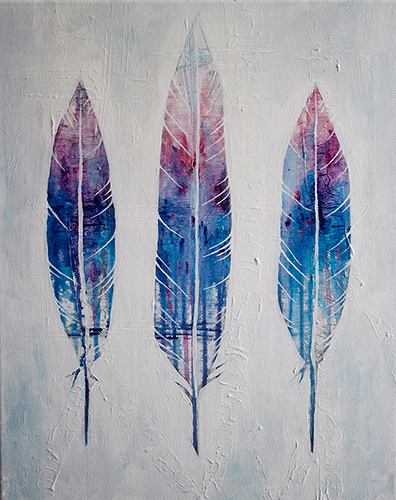 We will be creating a painting featuring the feather symbol and explore the technique of colour blocking. Pre registration and payment is required to reserve your spot for this event. Payment can be made upon registration through this website by paypal, by sending an e-transfer to art@thecreativesoul.ca , cheque or cash. Please note tickets are non refundable but are transferable. You do not have Brianna Gosselin’s permission to sell work with a similar resemblance to her original artwork. It is a copyright violation and will be treated as such.